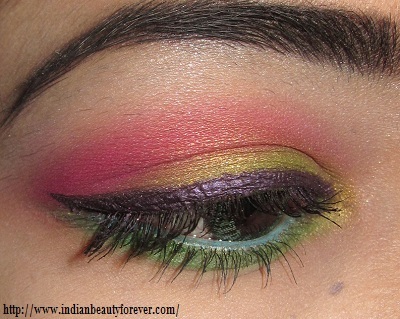 Happy Earth Day and on this day, I will share this colorful eye makeup look that I created a couple of days ago. I was suppose to post during the weekends but I could not do it on time. Anyways, this is an eye makeup look where I have used a lot of colors. Initially, I thought I will use only few of them but as it progressed, I incorporated more colors. Now, this is what happens when you get so see so many colors. :D.
And this is the look I came up with. Step 1: I had used this lime green shimmery color on the lid below the crease. Step 2: On my crease I have used a hot pink color. 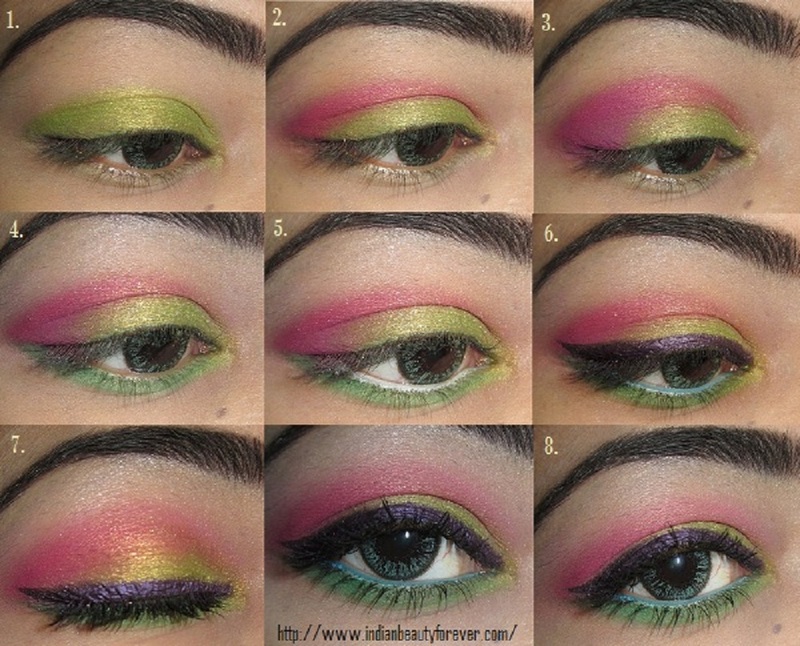 The intermediate color, as a result of pink and that lime color, gives a beautiful effect. Step 3: In this step I took another shade of Pink and dabbed it on the outer corner. Blended it and cleaned whatever id the excess. Step 4: I used a light green matte shadow underneath the eyes and tiny amount of matte yellow on the inner corner then gently merged it with the green I had used. Step 5: I used this white pencil on the waterline from Deborah Milano. And in between. I do keep cleaning any fall outs with a large fluffy angled brush. I find this way easier to get a little cleaner look. Step 7 and 8: I used mascara, 2 -3 coats, cleaned and blended where ever required and I am done!! Sorry about the light intensity change, due to which the colors may appear lighter or brighter sometimes!! 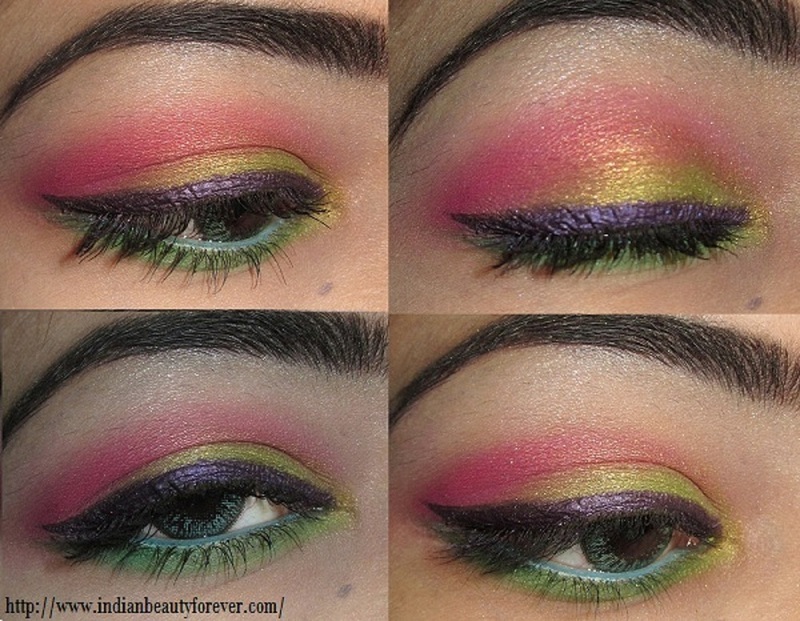 Hope you liked this summer colourful eye makeup tutorial. Its come out really nice!!! Wow super pretty look Nieshu. Very helpful tutorial! beautiful look Niesha .. loved all the colors together ..
Aww thank you so much my dear. :) <3 Hope you are fine!! Stunning eye look niesha! You should become a makeup artist! Thank you so much Ash. :) have to learn a lot before that dear!! Thank you so much Rashmi. :) Happy Earth day!!! OMG!!!! This is so beautiful! I never thought so many colours together could look so lovely. How do you manage to do it so neatly? It looks like something out of a magazine shoot. this is such a pretty and unique look !!! loved it ! Absolutely love the lower lash line...I'm so scared to play with colors down there because of how it creases with my lids!